I've been pretty restrained during the current winter sale. After spending the last few years maintaining some semblance of order in my wardrobe, I refuse to succumb to clutter. Unless it's on my list and ticks all the right boxes, I'm not going to shell out any money. I've come to the realization that it's easy to buy but a pain in the rear end to discard unwanted items. It pained me to see how much money I'd doled out for things that didn't fit, unflattering and purchased because they were heavily discounted. I doubt I'd put on/lose enough weight within days nor would my diminutive feet miraculously grow an extra inch or two. I've been on a hunt for white t-shirts for quite sometime now. I found these T by Alexander Wang hanging on the rack at Harvey Nichols. The normal retail price for this particular t-shirt is an eye-watering £70. Good grief. Even at £35, my hands trembled when I handed over my hard earned cash. I've yet to find slouchy and long tees that have longer sleeves (I like to cover my bat wing arms) and a more flattering scooped neckline. The off white long sleeved tee from COS was a mere £8.50, certainly more palatable in comparison to the likes of Splendid, Vince, Isabel Marant or Alexander Wang. 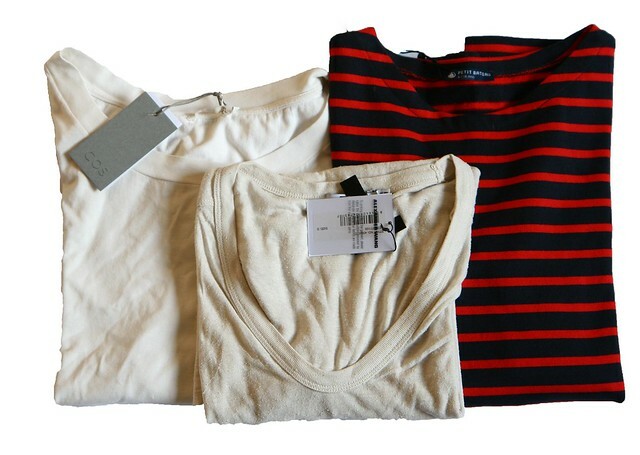 I take the opportunity to stock up on basics during the sale, particularly my favorite breton sweaters from Petit Bateau. 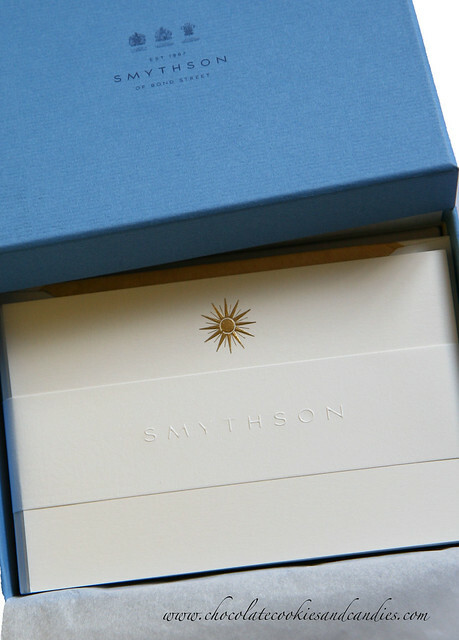 How can I resist these beautiful handmade notelets and envelopes from Smythson. The matching gold tissue inside the envelopes are painstakingly glued by hand at their factory in Wiltshire. I now have developed a full blown appreciation for these beautiful stationery. These are inexpensive but inexplicably English products. 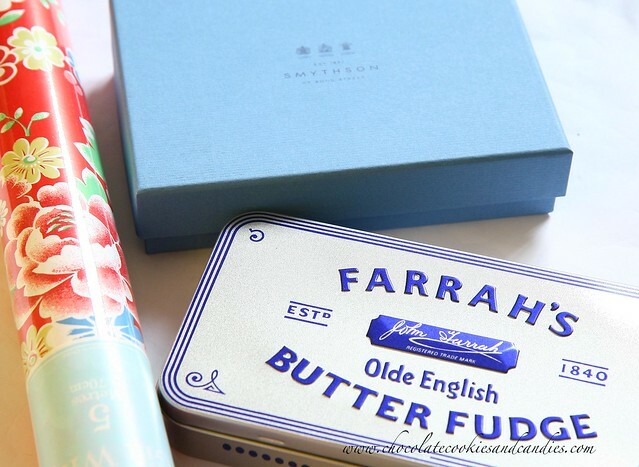 I'm addicted to Fortnum & Mason fudge but these ones from Farrah's will suffice for now until I get a chance to go to their store. I wouldn't attempt to order online from F & M after the recent muck-up of a job they made with my order. Cath Kidston merchandise are largely made in China but what the heck, they're overly kitschy that they're almost adorable. I wouldn't pay £5 for a 5 meter roll but £2.50 is a bargain. Lil L has a social calendar that rival that of most socialites featured in the fashion magazines. I've come to dread the words birthday party so an extra roll of wrapping paper always come in handy. My business cards ( yep that's a laugh in the present recession!) are from Smythson's and my writing paper, I love their stationary and their handbags as they are so under the radar. I'm with you, i have a lovely DVF dress still all tagged up, I need to focus on everyday clothes. Life is all about the supermarket these days! I haven't ventured into the stationary realm yet but these do look beautiful. Like you I have been quite picky with my purchases, unless they are on sale AND fit me perfectly I just won't buy it. You don't know how much junk I've inquired in the past. When I went to Vietnam in 2004 I bought so much stuff and ended up tossing them all because the fit and quality was awful! Beautiful stationery! And I'm definitely with you on trying to get rid of clutter. 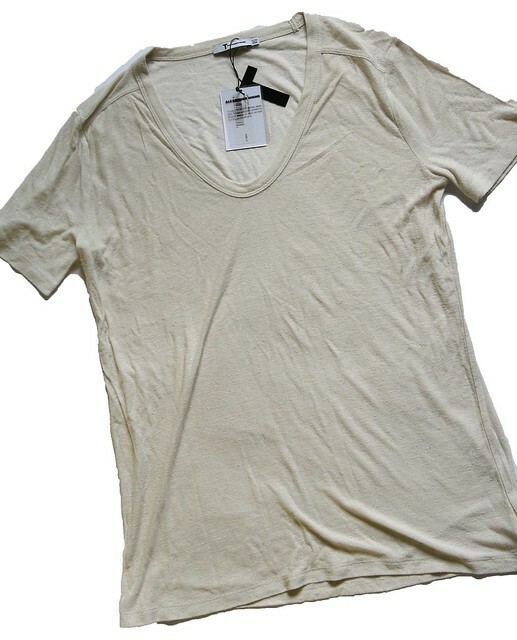 I'm always on the lookout for good basic soft tees nowadays. They always get the most wear anyway! Don't even get me started on clutter! My big new years resolution!! Definitely agree that buying is easier than discarding! I love stationery! The english ones look so classy and pretty. And fudge! mmm so good! Tabitha, I had to practise self restraint and not go overboard with Smythson's stationery. I managed to get rid of my wrap dresses and non casual clothes. I kept a few for the rare occasion that I've got to dress up (once every 2 years!). Thu, I guess the only way is to learn from our past mistakes. I shudder when I thought of the mountain high clothes and accessories which piled up over the years. I had a hell of a time clearing them out before our move to the UK. Chin, what did you buy? I couldn't believe how busy dressmart was last year. Shopping in NZ pales in comparison to here. So much temptation with all the online stores available at my fingertips! Alice, I had to have a mind shift in terms of my wardrobe these days particularly when I don't work in a corporate environment. I nearly caved in so many times when I saw a beautiful dress or exquisite detailed jacket but they won't work in my current lifestyle. So yes, basic tees and denim get the most wear. S, I feel so claustrophobic when the clutter builds up. One of the reasons why I refuse to move to a bigger place is I've got 2 hoarders in the family. They refuse to throw away anything. It's amazing how fast they can fill any empty space in the flat. katattack, the fear of accumulating kills any thoughts of buying sprees during the sale season. Farrah's fudge was a disappointment. It has a fondant texture which I dislike instead of the creamy and crumbly ones from Fortnum & Mason. Awesome - when I visit you, I'd love to go to Smythson and pick up a little treasure. No one sends notes anymore. I'm going to try and send more next year! I think it might be too wet to go out here tomorrow night - told you I didn't need clothes anymore! Have a good one whatever you do and a very happy New Year. sale also started in italy and i think i will buy many stuff for me and for my baby! happy happy new year to you my dear!